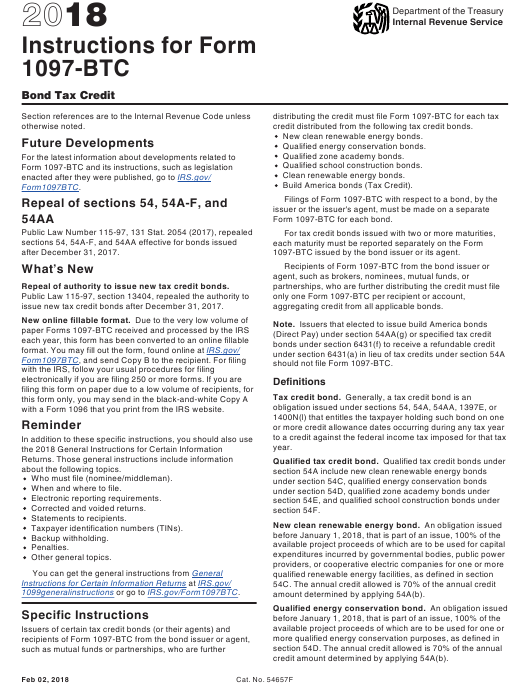 January 1, 2018 "Instructions For Irs Form 1097-btc - Bond Tax Credit" contain the updated filing procedures for the IRS-issued Form 1097-BTC. Download your copy of the instructions by clicking the link below. IRS Form 1097-BTC is tax form released and collected by the Internal Revenue Service of the United States. credit distributed from the following tax credit bonds. New clean renewable energy bonds. Build America bonds (Tax Credit). Form 1097-BTC for each bond. 1097-BTC issued by the bond issuer or its agent. Repeal of authority to issue new tax credit bonds. issue new tax credit bonds after December 31, 2017.
aggregating credit from all applicable bonds. should not file Form 1097-BTC. with a Form 1096 that you print from the IRS website. amount determined by applying 54A(b). credit amount determined by applying 54A(b). October 4, 2008, as provided in section 1397E. constructed with the proceeds, as provided in section 54F. one or more qualified projects, as defined in section 54.
bonds under section 141) as defined in section 54AA(d). should not be completed and box 6 is optional. no explanation is required for the IRS filing. anniversary of such day thereafter. providing substitute statements to recipients. Instructions for Forms 1099-INT and 1099-OID. Recipient, later, for furnishing statements to recipients. state in which the recipient is incorporated. number of the entity issuing the Form 1097-BTC. a P.O. box, show the box number instead. all of that credit to others. corporation should enter the Little Rock address. submitted online, by phone, fax, or mail. recipient's TIN is allowed on the statement to the recipient. under section 54. Enter code “199” for all other bonds. must be reported on a separate Form 1097-BTC. enter 25% (0.25) of the amount computed in STEP 1 in 5i. calendar year, calculated by using STEPS 1 and 2, following. amount determined in STEP 1 in box 1.
or exchange of the bond. published in the Internal Revenue Bulletin. 1097-BTC or sending a statement to the credit recipient. amount determined in STEP 1.